I have a favorite hobby this time of year. It’s called “Eat As Many Cadbury Eggs As Humanly Possible”. Trust me it’s a thing. I remember in high school, back when my metabolism appreciated excess amounts of junk food, hammering those things into my face until I was sick. But as you get older, you grow to know your limits. 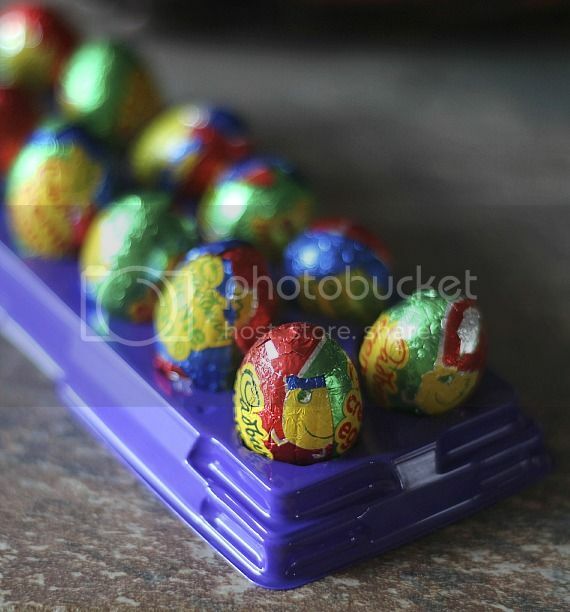 So instead of keg-standing Cadbury Eggs, I eat them in controlled excess… pacing yourself and all that. And the perfect way to get your daily Cadbury Egg quota is slipping them into other unassuming treats. Like Krispie Treats. I mean, duh. So today, I decided to get a little crafty while incorporating my 2 most favorite guilty pleasures…and made Krispie Treat Chicks…stuffed with a Mini Cadbury Egg. Just make a batch of Basic Rice Krispie Treats…but when your marshmallow is almost melted, tint it yellow, using some yellow food coloring. I used a gel based color. 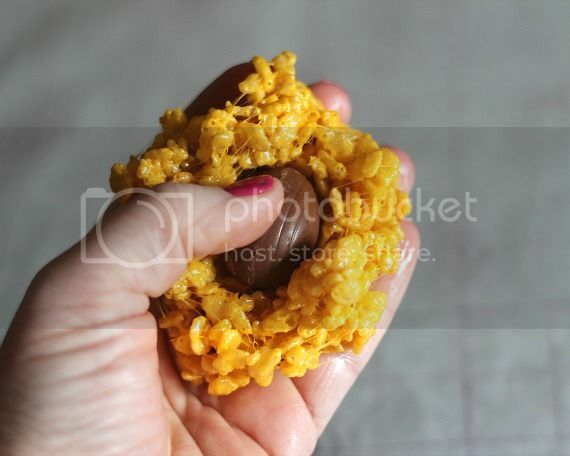 Grab about 1/4 cup of the Krispie mixture in your hands…you could spray you hands with cooking spray to help it not stick…just becareful not to use too much spray, because you will need to stick the eyes and the beak onto the krispie, and if you use too much they won’t stick. Place them on a wax paper or parchment lined baking sheet. 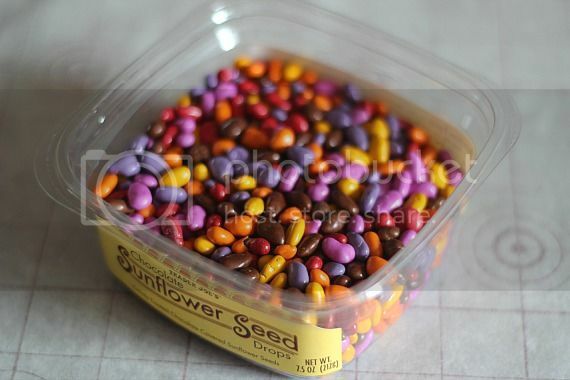 For the chick faces I used some fun chocolate covered sunflower seeds and Mini M&Ms. I thought the seeds were the perfect shape for their little beaks…and the M&Ms for their eyes (you could also use mini chocolate chips). 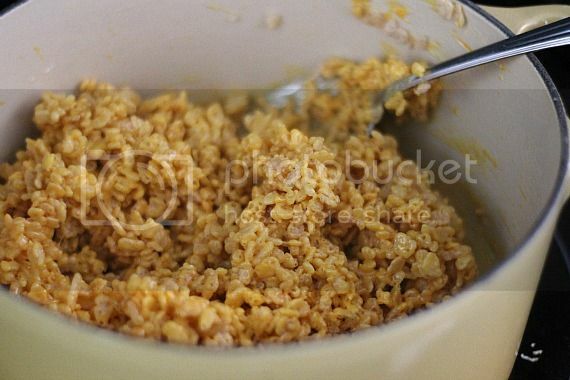 Just press them into the krispie mixture. Mine stuck with no problem, but if you used a lot of cooking spray on your hands to form the balls, you might have some trouble. So simple, and you get 2 treats in one! Make Krispie Treats according to directions, but as soon as the marshmallows are ALMOST melted, add in you yellow food coloring. Use as much or little as you would like to reach desired effect. 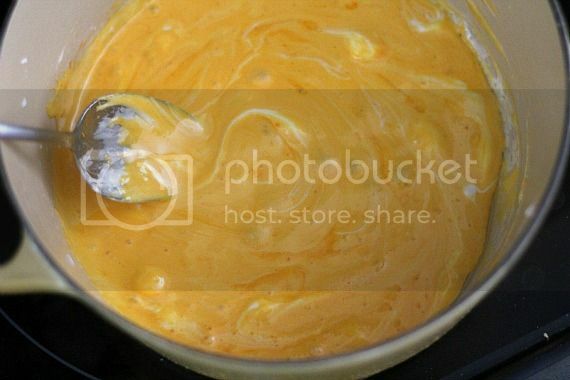 Immediately add in cereal and allow to cool for just a few minutes, so the Cadbury Egg doesn’t melt. 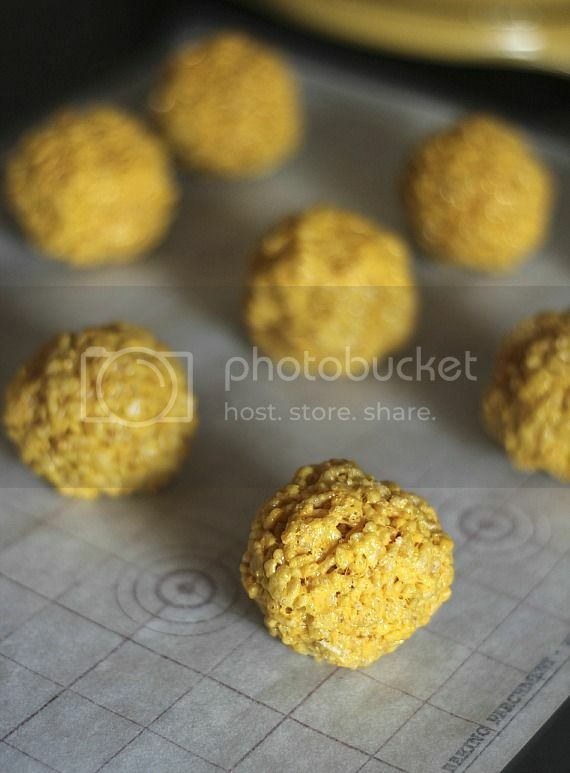 Using about 1/4 cup of krispie mixture, form a ball around each Cadbury Egg, placing on a parchment lined baking sheet. 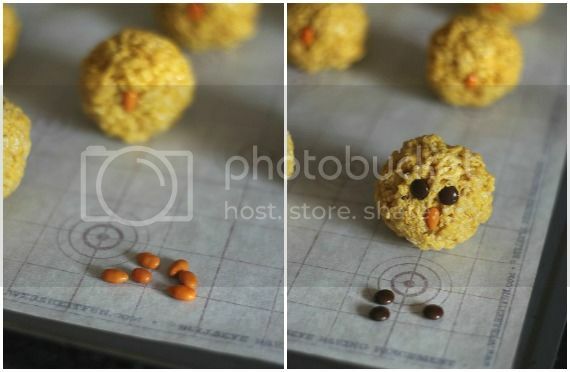 Press orange sunflower seed vertically on to ball, to mimic a beak, and 2 Mini M&Ms or chocolate chips for the eyes. Place each in a mini white cupcake liner for presentation. Store airtight for up to 2 days, although, best if eaten the same day, as is with any krispie treat. Oh my gosh these are so cute! I love food shaped as animals. The teenage metabolism is a wonderful thing. I think some are just lucky to be able to eat well into their mid years like my mum but that’s life for you. Oh heavens aren’t those cute! These are insanely cute, and insanely genius! You are the Rice Krispie Queen! Aww these are so freaking cute! I love their awesome little noses!! So adorable. And those little cadbury eggs, that was a genius move on Cadbury’s part. Easy to eat more of them!! Oh wow, yum! I love kripie treats, and I love cadbury eggs…. oh and I love cute treats, so basically I LOVE these!! I love Cadbury eggs and haven’t had one in years. Great idea to use the sunflower seeds! These are so cute and I love how simple they are! You are so creative! Also, I had my very first Cadbury Egg 2 years ago. True Story. Totally cute! These look great! I’ve been avoiding cadburys because I know once I have one…it’s all over. These chicks though…total cadbury portion control. And so cute too! Love it! Shelly these are too cute for words!! These are adorable – and the cadburry egg inside – who wouldn’t love that? I love the surprises in the middles, too. These are too cute to eat, absolutely love them! ! IN LOVE with these! So dang adorable! These little guys are so cute! And I do have an abiding affection for Cadbury’s Creme Eggs. Confession: I hate Cadbury Cream Eggs. No shame. I do, however, LOVE the caramel eggs. Problem solved. These are cutest witto chickie treats ever. Like, ever. Those are the cutest, I love the little beak! Just made these in time for tomorrow’s celebrations. Couldn’t find covered pine nuts here in Ireland but orange tic-tacs worked a treat!! oh wow, these are fab , ive stumbled across your blog and just found this. 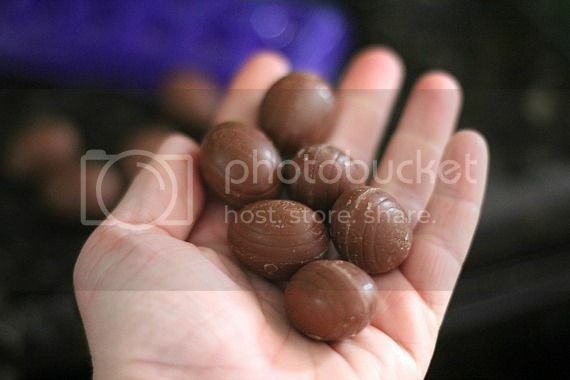 oh my…when i was in high school id eat 2 full size cream eggs for my lunch nearly every day….the shame of it ! lol. so how about big chicks with full size eggs?….or am i being greedy. thats a great tip also…the person up there who said use tic tacs…brilliant. Seriously…these are genius and ADORABLE!! These are the cutest little treats….. and we LOVE the hidden surprise inside!